Luke Schmaltz has extensive experience in martial arts and personal training, which informs his writing on health and fitness. He also spends time in the entertainment world as a songwriter and performer. He has written and produced numerous studio albums and published many articles online. 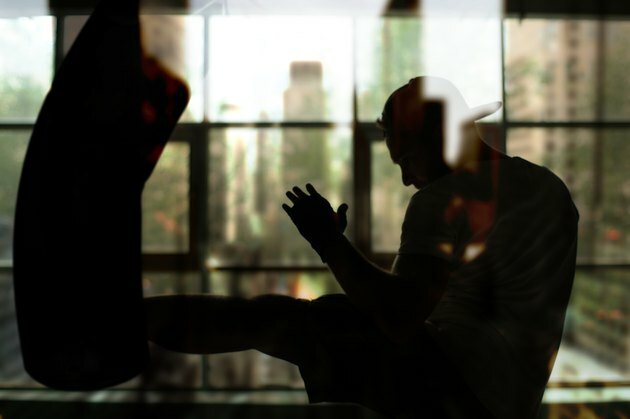 Kicking a punching bag is a workout with secondary benefits. Not only does it benefit your legs, your abdominal, oblique and lower back muscles also get significant activation from the dynamic nature of the strikes. Factor a heavy bag into the equation and the exertion level increases with the high velocity contact. The result is exercise that burns calories, develops coordination and builds strength. Kick hard. The bag can take it. Stretch thoroughly to prevent injury. Target your hips, hamstrings, quads and lower back, and place particular emphasis on your inner thighs. Do not bounce your stretches. Hold them steady for a minimum of 25 seconds while gradually stretching the muscle to a mild burning point. Cover your shins and the tops of your feet with kickboxing pads. Even though a punching bag has some give, it is only to a degree. Practice the basic movements of front kicks, side kicks and round kicks before you get to the bag. Regardless of which kick is being used, there is one mechanical essential: Thrust the knee of the kicking leg up to your hip level or higher before extending the lower leg to strike. Land front kicks with your forward leg striking with the ball of your foot. As the bag swings away, plant your foot down to the floor and then bounce it back up into another kick that meets the returning bag head on. Perform 50 reps, then switch sides and repeat. Rest one minute and do two sets, kicking with each foot from the rear leg position. Hit the bag from the side with your shin bone when doing roundhouse kicks. Kick with both legs from the front position 50 times and rest for one minute. Then throw round kicks with each leg from the rear stance position 50 times. Your knee should come up toward your elbow as your hips twist into the kick, placing your kicking leg at a perpendicular angle to the target rather than at an upward trajectory. Thrust your knee up towards your face at the beginning of each side kick. This adds additional work for your core and develops strong blows. When you extend your leg and make contact, use the ball of your foot. Perform 50 side kicks with each leg in the front position and rest for one minute. Then perform 50 side kicks with each leg from the rear position. Combine all three kicks in triple strike reps starting with the left leg in front. Throw a front kick and plant your foot down again. Then throw a roundhouse kick with the same leg and plant it down again followed by a side kick. The strikes should happen in rapid succession as if they are all part of one assault. Perform fifty triples with each leg in the front position. Rest for one minute and perform 50 triples with each leg from the back position. Make sure your fighting stance is about shoulder-width apart. Too wide of a stance will result in weak kicks and carries a greater potential for pulled muscles. Although this is primarily a kicking workout, include a secondary exercise for your hands. Always keep them up by your head in a guard position. Resist the temptation to let them flop down at your sides as you get tired. Repeat the stretching routine you did at the beginning of the workout when you are done. This will reduce soreness. What Muscles Do You Use on the Vertical Jump?